Usually on Sundays the family all goes up to the local Petco pet store for adoption day. Wilma and I come along to attract customers. Sometimes they want to adopt us too but mom is pretty quick to say no. People like to look at us and are always amazed when they hear how old we are. Sometimes I get upset being so close to the snakes, but as long as Wilma is there with me I feel better. She isn’t afraid of anything! I get to sit next to her all day. And we meet the nicest people! Okay, I don’t really watch TV but mom says she is on some MTV reality show, whatever that means. 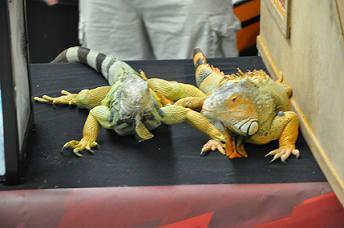 Sometimes, people see us and just want to go get a baby iguana from the pet store animals. We try to educate people and make sure they understand that iguanas are awesome pets but they do take a lot of attention. And that tiny little lizard you get at the pet store is going to turn out big and awesome like me one day! 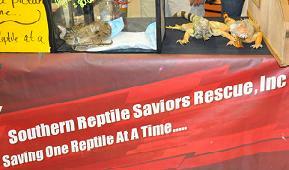 You know mom, dad, and my brother all have official reptile rescue shirts, I attract more attention then they do. I think it’s about time I got my own official shirt!